I wrote about our woodstove experience back here. I do want to add a few points since I wrote that post. I have since realised that the Scandia Cuisine is really oversized for our house. You can't buy the Cuisine anymore, but the Heat and Cook is similar and rated for heating 200 m2. Our house is only 84 m2! We find that to get the oven hot enough to cook we often have a fire so hot that we have to open windows to cool the house. This is not a problem with the woodstove itself, but just a warning that you need to consider the size of your house and the rating of the heater when choosing a model. If you get a woodstove that is too big you will use more fuel to get the oven hot and may have to overheat your house to really make use of the oven. The size of this woodstove does mean that we can keep it burning overnight or during the day while we are away and the house stays toasty warm. We have also found that the size of the oven is perfect as you can fit larger roasting dishes and cook a whole meal in there. And I love the ash pan for cleaning out the firebox, that is a really good feature for cleaning the firebox without getting ash everywhere. The other aspect to consider is installation, as I wrote back here. Woodstoves are heavy, so you need a plan for getting them into the house, and the smaller ones are definitely easier to maneuver. You also need to have a suitable place to put the woodstove - the hearth requirements will be specified for the heater, and you need a long enough flue to get a good draft going (this works better if you can put it near the roof peak, we put the Cuisine at the low point of the roof, so we have a very long flue poking out and its difficult to access it for cleaning). We are planning on putting a woodstove in the lounge of our secondhand house. We get winter overnight temperatures below freezing for 3-4 months of the year and we have a property with plenty of firewood as the previous owner was a fencer and left piles of felled trees from the 20 years that he owned the property and cut down trees for fence posts. We need winter heating, and we have a sustainable source of fuel, so it makes sense to install a wood heater to keep us warm. If we are going to burn wood for heating, we like to also use it for cooking, so another woodstove is our preference. It will probably in the corner rather than the middle of the wall as it was previously, we've already plugged the hole in the ceiling and replaced the roof, so it doesn't matter if we move it. The main area (lounge and bedrooms) is 70 m2, and the entire house is 130 m2 (including the bathroom and side veranda). We need to take into account the lack of insulation in the walls and the older wooden windows in some rooms, which are not as well sealed as new aluminium windows, so a slightly larger heater would be a good idea. Our house at Eight Acres is relatively new (c. 1997) and has insulation in the walls and ceiling, as well as new windows (although I do notice draughts under the doors) and we really notice that it was easier to keep warm than our previous draughty Queenslander. I expect that the secondhand house will need a bit of extra heating to make up for the lack of insulation and extra darughts, but we are trying to seal it as much as possible and have insulated the ceiling. As I said, Scandia have stopped making the Cuisine. We could try to take this woodstove with us and replace it with a wood heater, however after the ordeal of moving the 248 kg woodstove into the house, I would prefer to leave it behind! And I think its going to be bigger than what we need anyway. Scandia now make a similar model called Heat and Cook, which is available from Bunnings. Jane from Our Aussie Off Grid Heaven has written about her Heat and Cook experience here. It looks like a good woodstove and from what I've read (and discussed with Jane via email) they are happy with it so far. If you have a large (or poorly insulated/draughty house) this would be a really good option. If you are interested in this model I suggest you visit Jane's blog and ask her any specific questions. Nectre still make their Baker's Oven, which I see now is rated to heat about 90 m2, so it probably would have been perfect to heat our current house! Thermalux make a Gourmet cooker, which is rated for 80 m2. I'm wondering now if these are both a little small for our secondhand house though, and I really would like a larger oven again. If you have a small house, or just a few rooms to heat, theses two options would be ideal. Another model is the Eureka Cooker, rated for heating 120 m2. It only weighs 180 kg, so its relatively manageable and looks to have a decent size oven. I have asked Eureka for more information about the oven size. Pete is also concerned that its not fully cast iron. Cast iron is heavier, but more durable and holds heat for longer. Our old Scandia is cast iron and so is the Thermalux from the photos (although not the top of the Thermalux we think). The other thing I haven't discussed is that these cookers are "an investment" at $2000-3000 each. You can get small woodheaters for around $1000, so its more expensive to get the oven, but you then have more flexibility to use the heat for cooking and not use as much electricity or gas. If you have to pay for firewood anyway, you are using it twice if you can also cook with it (however, if you are paying for firewood, there may be a more economical way to heat your house). Some of the models can also be connected to preheat your hot water (not sure if the Eureka has this option, but looks like the others do), which can also be useful for off-grid houses. If we choose a new woodstove, want to see it in person before we buy it. The two previous woodstoves we ordered over the phone and didn't see them until they arrived at a transport depot for collection! It would be nice to have a good look at it before we buy it this time, however it can be difficult to find them in stock in Queensland. I haven't made a definite decision, but I'm closer than I was before I wrote this post! Please share your woodstove experiences! Are there other models available that I haven't mentioned? Which ones have you tried and which ones do you recommend? Why you need a woodheater and why you may as well use a woodstove if you're going to get a woodheater anyway. Woodheaters vs woodstove (in case you're not convinced yet!). If you have a woodheater without an over, you can cook in the firebox. How to clean your firebox while the fire is still burning, and other maintenance instructions. 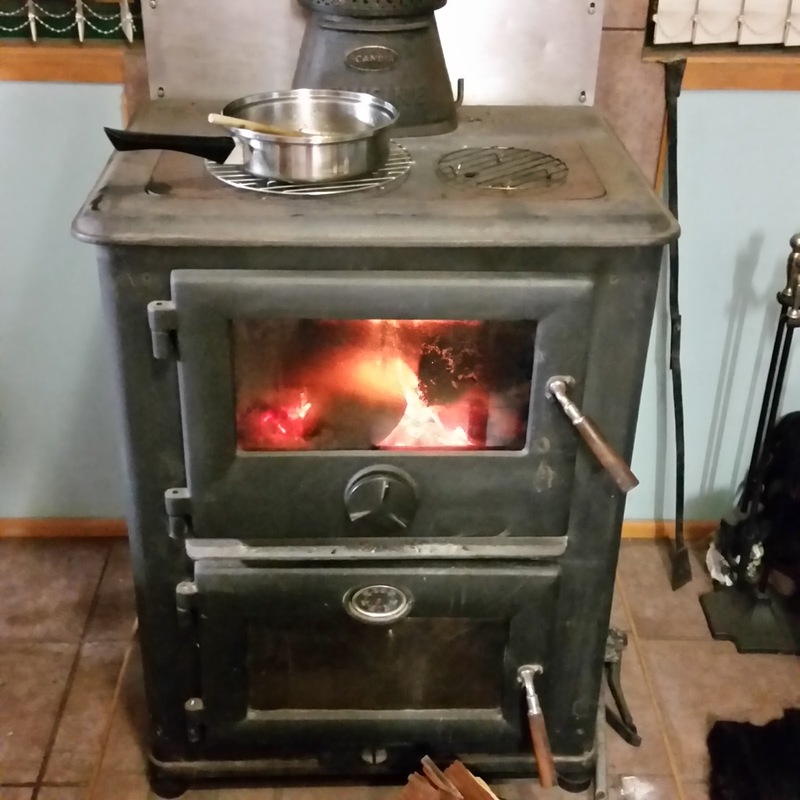 Some basic information about using a woodstove for cooking. Hi Liz. Regarding wood stoves, have you considered refurbished. I really wanted a new wood stove in our home as wood stove cooking is my preferred option. However when we looked at new stoves they were badly made or really really expensive. There is a business in Toowoomba that has been around for many years (their dad started it I believe) and they restore wood stoves. Pretty much any make or model. They have some ready to go or you can select a derelict model for them to apply their many talents. Our stove has been installed now for 4 years and is used everyday. It heats our water and is the heart of our home. Please consider giving an old faithful a new life, the quality is better and you would be supporting home grown business.